Take Note has been an important part of local communities for many years, offering real personalised service, delivering our customers essential services along with a great range of books, stationery and gift ideas. As part of the Paper Plus Group, New Zealand's largest specialist stationery and books group, Take Note now has 13 stores stores throughout New Zealand - all locally owned and operated. Over half of our stores have a full NZ Post agency and some incorporate Kiwi Bank services and Lotto - all part of meeting the needs in your local area. We're local, so we tailor our range and special offers just for you. Look out for your local Take Note store, for all your books, stationery and postal needs. Choose your gift at any Take Note store. Present this Gift Card for full or part payment of the merchandise. The amount of any purchase will be deducted from the balance of the card. Click here to check your Gift Card balance and expiry date. 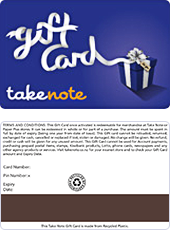 TERMS AND CONDITIONS: This Gift Card once activated is redeemable for merchandise at Take Note or Paper Plus stores. It can be redeemed in whole or for part of a purchase. The amount must be spent in full by date of expiry (being two years from date of issue). This Gift card cannot be reloaded, returned, exchanged for cash, cancelled or replaced if lost, stolen or damaged. No change will be given. No refund, credit or cash will be given for any unused amount. This Gift Card cannot be used for Account payments, purchasing prepaid postal items, stamps, Kiwibank products, Lotto, phone cards, newspaper and any other agency products or services. 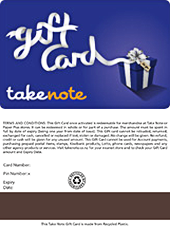 What value can be loaded on to the Take Note Gift Cards? How do I know how much credit has been loaded onto a Gift Card, and how do I know how much credit I have left? The remaining balance is printed on the store receipt. The balance can also be checked at www.takenote.co.nz. What information can be viewed at www.takenote.co.nz? The card balance, history and expiry date can all be viewed online. How many times can I use my Take Note Gift Card, and can I top it up? You can use your gift card as many times as you want until the balance reaches zero. Once the gift card has been fully redeemed, it cannot be reused.